Polyurethane Color Pasteof high quality is manufactured for specializedapplicationsby using Pigments and other polymeric raw materials of only reputedmakes with most appropriate specification. Krisons Polyurethane Pigments available for matching any colour as per your sample. They are also available for jet black colour and other shades for master batch's & Dosing. U.V. stabilzer also available in pigments. Located in Uttar Pradesh (India), we are the reputed Manufacturer and Supplier of PU Pigments. It is a PU resin concentrate. It can be diluted in organic solvent to make spray/ dipping solution (Lacquer). This product has excellent gloss and flex properties. It is used as a binder for PU covering spray/ dip. 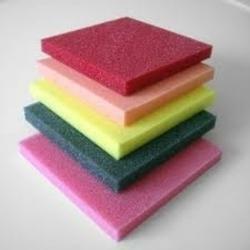 Aplication: Upper Finish of PU Foam and PU soles. Comprehending the varied desires of our clients, we are instrumental in presenting a comprehensive range of PU Epoxy Pigments. Chemie Products manufactures high quality Polyurethane Colorants for specialized PU applications by using Pigments and other polymeric raw materials of only reputed makes with most appropriate specification. Product Name: PU Pigment Black and Other Shades. 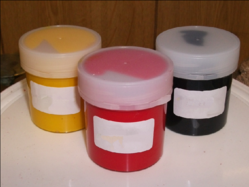 Product Description: Pigment dispersed in low weight polyol with additives. Hazard Identification: Not a dangerous product according to EEC criteria. We take special care in understanding the application, end product, consumer taste in designing the customized coloring solution while maintaining the compatibility with due consideration of ease of use and longevity.